With United retiring its 747-400s at the end of October, I am taking advantage of every opportunity to fly the Queen of the Skies this year. This trip, as I explained here, came about at the very last moment but worked out splendidly. I was particularly interested in this route because I flew FRA-SFO in first class and published a detailed review just two years ago. This was my first opportunity to test the new United Polaris onboard product. United’s Polaris First seat, formerly known as Global First, is extremely comfortable, with ample personal storage compartments and comfortable padding. It is also on its way out. United will retire its 747-400 by the end of autumn and the seat will be gradually pulled off the 777 and 767 fleet during Polaris retrofitting or due to aircraft retirement. Thus, the days of this seat are numbered…yet United’s new Polaris Business seat is built off of a similar frame and we will still see these “Polaris First” seats for at least the next couple of years. All items are now waiting at your seat as you board, including the rolled-up mattress pad (Polaris Business passengers must request the mattress pad). Slippers are also present on all Polaris flights. You can also request a special memory foam gem pillow, of which there are a limited supply onboard. Housed in a light blue pillowcase, this pillow was cool to the touch and provided a great contour for my face when sleeping. Overall, the blanket and pillows are similar to before, which is a good thing — the blanket is light and yet cozy, exactly as it should be, and the pillows and mattress pad quite comfortable. In sleeping mode, the bed is 6’4″ and FAs are available to make your bed upon request. I slept soundly for 7 hours on the flight to San Francisco. I wanted to stay up the entire flight and work, but a combination of fatigue and tepid internet speeds over Greenland led to an extended nap. A special amenity kit for Polaris First passengers is given. Gold in color (business is blue) it contains a few additional items, but is about on par with the previous kit. In fact, I’d take the old kit because of the wooden comb, Scope mouthwash, larger tube of toothpaste and shoehorn, though many might find the Cowshed amenities far superior in this kit. United claims to have “re-invented” the onboard dining experience with Polaris and I was excited to see first-hand what had changed. 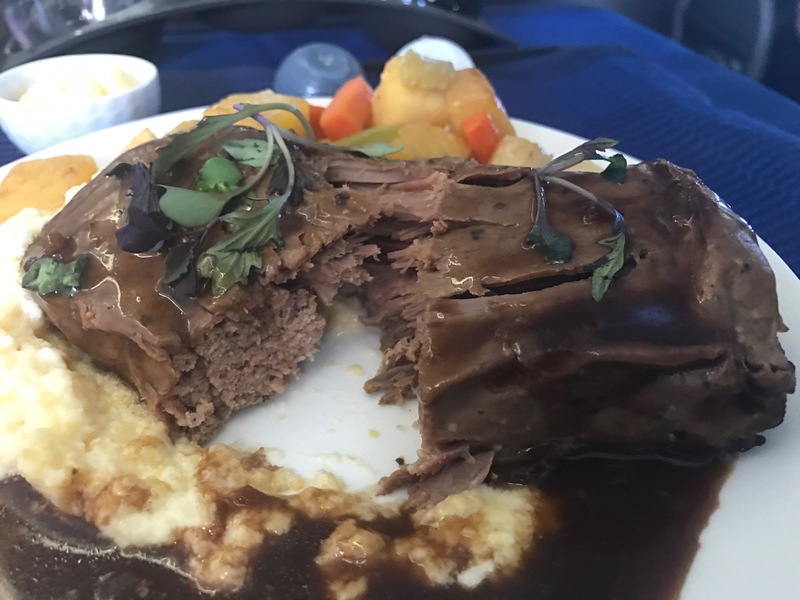 Although the food is undeniably an overall improvement from the past, United did eliminate some items while adding others. Upon boarding, a beverage is served in a specially-designed cup accompanied with a chocolate truffle. While I’d prefer to have a pre-deapture drink in a real glass without the chocolate, I appreciated the effort and the man sitting across from me gobbled down his chocolate and asked for another. The menu in Polaris Business and Polaris First is nearly identical, but not quite. Polaris First still offers a soup course between the appetizer and salad that is not on the Polaris Business menu. Soup is now also offered as a mid flight snack in both business and first, so Polaris Business passengers can actually have soup now with their main course if they request it. Gone is the hot appetizer found in Global First, replaced by an amuse-bouche and a larger cold appetizer. The amuse-bouche was a sewer with feta cheese, cucumber, black olive, and tomato. Hot nuts are still served and refilled are offered in Polaris First laded from a silver dish, as before. A new feature in Polaris is an optional wine-tasting course, which offers the chance to sample either three red wines or three white wines. Because I had ordered beef for my main course, I sampled the red wines and must give United credit for this innovative offering. All three wines — pictured below — were actually very good and also appeared on the menu. For a couple years prior to Polaris, United had no wine menu because the choice was so hit or mis. A full wine menu is back. The appetizer was mozzarella with tomatoes, basil, and balsamic and was very nice. A simple appetizer, yet a delicious one and frankly far superior to the warmed up empanadas or samosas of years past. Next up came the soup course, carrot ginger, served in a larger bowl than the “thimble” used in Global First. You can rarely go wrong with soup and this was delicious. Place settings are no longer laid in first class. In Global First, service began with a drink glass, bread plate, salt and pepper, butter ramekin, and silverware neatly ranged on your tray table. Now, a tray is used in Polaris First as it is in Polaris Business. There is also no bread basket in Polaris Business or First. Instead, two pieces of bread are placed upon your tray. For this flight, it happened to be what I would have chosen anyway — pretzel roll and garlic bread. Soup was followed by a salad course, smaller than before, but now including items like feta and olives. A FA still adds salad dressing and fresh-cracked pepper from the cart. I ordered short ribs for the main course because I wanted some protein and figured that a short rib would not be as dry as a “steak” on a plane. The portion was HUGE. I could only eat half of it. While it wasn’t exactly dry, the beef gravy was not that great. Some BBQ sauce would have made all the difference. Still, decent quality and certainly edible. The mashed potatoes and root vegetables were great. Next up was a cheese course. Cheese used to be cut from rounds in Global First and served with a selection of crackers. Now, the cheese course is pre-plated and comes with only packaged crackers. I do miss the selection of crackers, but the cheese quality was good. Finally, dessert. This is truly an upgrade. The same sundaes from before are still available with all the fixings, but now additional sweets are available. My flight featured macaroons, mini tiramisu, and cheesecake. I had a macroon with a cup of illy coffee and it hit the spot nicely. By the time meal service was over, I was very full. You will never go hungry on United. A mid-flight snack cart was set up by Door 1 Left and drink cart by Door 1 Right. It included leftover dessert items, chocolate, fruit, chips and trail mix. 90 minutes prior to landing, a second meal is served. The pre-arrival service has been upgraded to include a hot meal and I enjoyed this meal — a warm chicken breast with tomato basil sauce served with green beans, couscous and green salad — more than the main meal. The other choice was an antipasto plate. I do miss the hot cookies that used to be served in first and business. Overall, I’d call the meal service an upgrade. The new placemats, dishes, cups, and glasses are all attractive and the food itself is very competitive with leading business class products of the world. Sure, I miss the bread basket and the old crackers/cheese course, but overall United gave a lot more than it took away. Wi-Fi has not changed. The price was only $16.99 for the entire flight, which is a great deal. Speeds are tepid and the internet stopped working for a few hours over Greenland, but was functional over Europe and as we approached San Francisco. IFE is also unchanged and offers a nice selection of movies, TV, and games. I did not retake pictures of the screen, but you can get an idea of the interface here. I wanted to watch Denial both on the trip to Germany and on the trip home, but never got around it with my work + nap. FAs are happy about the upgraded service and my crew — a veteran SFO-based crew — was wonderful. I have never had a bad crew in Global First and this crew was friendly and motherly. Older, motherly FAs on UA are quite different than the Singapore/Asiana/EVA model and I do not assert that one type is better than the other, but only that the crew was great on this flight. One FA in particular — Loretta — who did much of the work up front — really shined. Age is just a number. Polaris First and Business lavatories are kept clean and feature Coweshed amenities. Cloth towels would be greatly appreciated. I’ve compared Polaris First to Global First throughout this review. The bottom line is that while service and the hard product (seat) are identical to before, new bedding and enhanced food represents an improvement. United Polaris First is 10K miles more than partner business to Europe and the same price as partner business to Asia. That, to me, is worth the extra miles due to the comfort of a large seat. Taxes run about $120. The fuel surcharge on Singapore would be approximately $400. United is removing first class from its longhaul fleet and thus it is not surprising that the distinctions between Polaris Business and Polaris First are even less than before. If you consider Polaris First business class service with a first class seat, you should come away very satisfied. Noting that the food and bedding I received in first class is nearly identical to Polaris Business passengers, I think United has a truly competitive business class offering with a better product than Lufthansa, SWISS, SAS, TAP and Brussels. The new Polaris Business seat will give it a far superior seat to the carriers above as well as Austrian and Turkish. Happy to see that you’re one of the few guys out here writing trip reports where every other sentence isn’t a credit card shill. Nice change of scenery on Boardingarea. I’ve always loved the UA first seat. I was lucky enough to snag them on the 747 for the three trips I took to SYD over the last 10 years. Say what you will about the soft product during that time, but I consistently got great sleep. The Polaris seats look nice, but I am sad to see the first seat being phased out. Completely agree with “Lack”! Good review and keep out those credit cards! Not many people are doing trip-reports about Polaris First due to the fact that its days are numbered, and there are more exotic options. However, I appreciate that you did because Polaris First may be the most efficient use of Amex MR points (via Aeroplan) for getting to Europe comfortably without fuel surcharges. I think LX, SK or LO in C w/o surcharges are pretty efficient (especially to Europe 2 where the F surcharge is quite high). UA F to Europe is decent value with UA MP miles, only 10k more then partner C.
Oh, and TK is surcharge-free AFAIR, but that’s a big detour for much of the region (could be worth it if someone hasn’t been to the CIP yet). Good point on Europe 1 vs. Europe 2 on Aeroplan. Certainly only a good deal in Europe 1. The key word in my original comment was “comfortably”. I was going to say “premium cabin”, but then the 3x4x3 United J would have qualified. Turkish also would have qualified, but as you mentioned, it would literally require a cross-continental detour (especially for the lucrative ‘Europe 1’ destinations). As far as coach redemptions to Europe are concerned, with the low fares currently being offered, I would rather pay cash and earn miles instead of burning them. Very interesting review. I may actually have to reconsider flying United to Europe. If it really is better than most of the European carriers, that’s a huge win for award travelers. I don’t think Singapore Airlines charges fuel surcharges on united awards, I flown in Business and was not charged. What routing did you fly on United? FCO-FRA-IAD-IAH Originally booked using Singapore Miles on Lufthansa, then called and changed to United,was refunded majority of taxes with the exception of the first leg. Interesting data point. How recently was this? Agree with other posts about credit card advertisement. I just flew GlobalFirst from SFO-HKG. First time since Polaris. No more setting your tray with the silverware cart coming down the aisle before the meal service. No more sushi cart (for asia flights at least). RIP GlobalFirst. I had flown over on First on Lufthansa the week before on their A380. I was pretty impressed with the new Polaris product. Did miss the older cheese assortments. The service was good. Food was good. Had seat 1K – and that was a treat as well. But think the only real difference for me between UAL business and Global first on the 747- are the seats. I thought this First crew were great. Thanks for your great review. Thanks Wayne for your kind comment. I think the cheese is a big downgrade as well. I am curious but does united not supply pajamas on its first class? Only on flights over 12hours (in business or first class). FRA-SFO is just under the limit.